More often than not the applications that I find the most enjoyable to use are those that solve specific problems. It’s even better if the developer of those apps made them to solve a problem for themselves. That’s exactly what I found this week at Apple’s Worldwide Developers Conference (WWDC) in Nodconcept, a company that makes three iPhone applications: Travel Assistant, Travel Help and Room. The brainchild of Chris Diskin, Nodconcept’s goal is very simple–take the headache and paperwork out of traveling. What’s even more interesting is that Diskin is a frequent traveller and made the apps because he was a bit frustrated in all of the time it took to organize everything. I think we’ve all been in that spot once or twice. I spent some time with Diskin discussing the apps and took a look at some of the features. 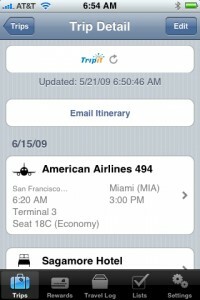 You wouldn’t think a travel app would have any cool features, but Travel Assistant definitely did. 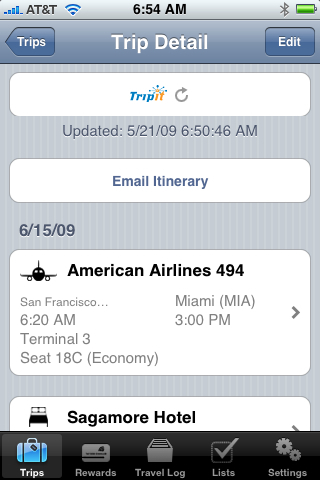 For instance, Travel Assistant syncs with the popular TripIt travel Web site, which is dedicated to organizing your whole trip into one master itinerary. If you already use the service, you can just login from within the Travel Assistant app and sync your data. Diskin thought of a few other things that typically makes travelers pull their hair out. Have you ever shown up at a hotel and needed your confirmation number? You’re tired, cranky and just want to get to your room, but now you have to search through your papers or email to find that number. Since Travel Assistant has your itinerary stored on your iPhone, all you have to do is open the app select your itinerary and turn it to landscape mode. The screen dims and your confirmation number is displayed in large characters making it easy to read. That also works for things like passport numbers when going through customs. In my experience, my passport is most likely in the overhead compartment of the plane when I’m filling out custom forms, which means that I’m running down the jetway trying to write in my number. However, since my iPhone is always with me, accessing my personal info is very easy. Travel Assistant also syncs with the iPhone’s Address Book and allows you to store other travel information like frequent flyer cards, rental car company rewards cards and the like. There are a lot of great features in Travel Assistant that are specific to helping you organize your trip, but Diskin had a couple of other ideas too. If you travel internationally, you may know that not all of the services or emergency numbers and procedures are the same as North America. To help those users, Diskin made Travel Help. Travel Help is a very simple app that has a list of over 260 countries and the local emergency contact information. Each country has a listing for ambulance, fire and police. 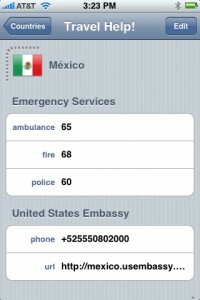 The app also has the phone number and Web site address for your embassy in the country you’re in. Finally, the simplest app I’ve ever seen, but one I will definitely use–Room. Have you ever dropped off your baggage, went out for a coffee and when you came back to the hotel you couldn’t remember what room you are staying in? I’ve done this. Even worse, as a frequent traveller, you get to a new city and try to open the room of the last place you stayed. I’ve done that too. Room allows you to input your hotel room number into the app, so you won’t forget where to go. You can launch the app and it will show it to you or better yet, the app displays a badge with the room number, so you don’t even need to open it. Diskin thought of pretty much everything in putting these apps together. 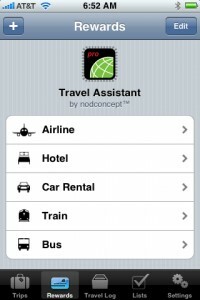 Travel Assistant Pro with TripIt costs $9.99; Travel Help costs $1.99 and Room is free. All of the apps are available from the App Store.